This past Saturday we had a fantastic tree planting at Fort Mahan. 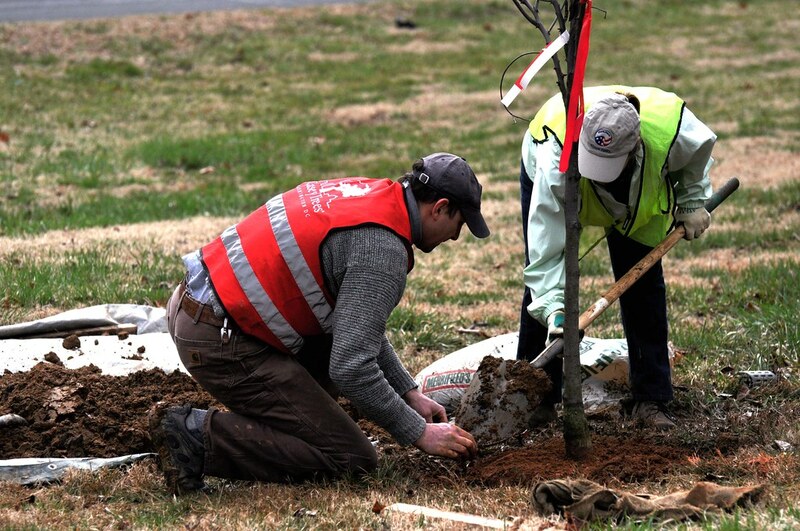 Including volunteers and staff, there were 84 people helping to plant 26 trees. We planted oak, persimmon, tulip poplar, redbud, amelanchier and sycamore. Joining us at the planting were 26 Peace Corps returned volunteers and staff, 16 Citizen Foresters, 14 volunteers from Anacostia Groundworks and other volunteers from National Park Service, Deloitte Touche and School Without Walls. Peace Corps volunteers celebrated the organization's 50th anniversary by planting with Casey Trees this weekend. We were really excited to have such a great turnout and we'd like to thank everyone who helped out. You can see more photos from the Fort Mahan event as well as others from this season on our new Flickr page. We have a full planting schedule ahead this season - check out our online calendar of events to register as a volunteer.